At the Nebraska Capitol’s rotunda, qualified representatives of governmental affairs offices line the halls, ready to answer questions and represent their clients in the Unicam. We know firsthand that when it comes to traditional government affairs, successfully representing a client’s cause heavily relies on credibility and a deep understanding of the ins and outs of the law. In the case of special interest groups in Nebraska, an insiders-knowledge of the Nebraska Legislature is a must. Like most businesses, clients are the engines who drive government affair firms. When our team partners with special interest firms, we help them reach their clients in the most efficient way possible. The day-to-day process of representing a special cause or interest is reciprocal, meaning clients of government affair firms must know the laws. In turn, these representatives work with their clients to provide information during the Legislative session. For many firms, this is through website design. When a business is in need of a special interest firm to represent their cause, there’s little chance they are going to settle with someone they don’t trust. They’re going to scour the web looking for someone who has a proven track record. The best way to present your firm’s success to potential clients is offering a well-designed website. Take our work with American Communications Group (ACG) as an example. The firm came to us needing a user-friendly website that highlighted client success stories. 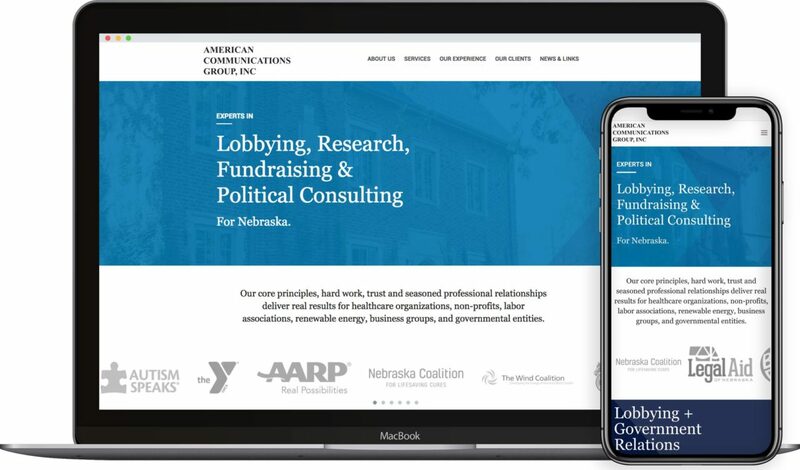 Our team organized a website showcasing the positive impact ACG has on its clients and updated it with new photos to appeal to potential partners. Now, ACG’s potential clients can easily find pertinent information in one place, while gaining a deeper understanding of how the firm works. Similarly, Radcliffe & Associates is a firm deeply rooted in local politics. This Nebraskan firm takes pride in serving as a liaison between its clients and legislators. When they came to our team looking for a way to better connect with their clients, our team had a plan of action ready. 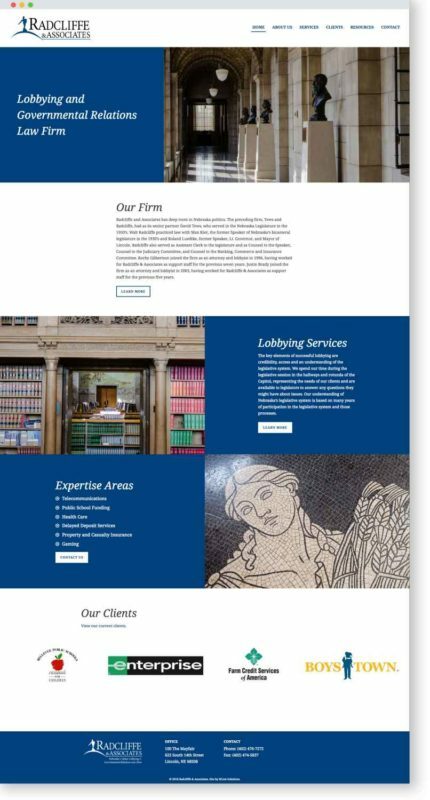 The first step in working with Radcliffe & Associates was crafting a website that displayed their tradition of excellence and making it more user-friendly. From the Radcliffe & Associates website, users can view the firm’s history of success and easy ways to contact the firm about using their services. Additionally, one of the easiest ways to communicate for governmental affair firms with large client bases is through email. Our team helped Radcliffe & Associates with this by migrating all of the company’s email data to MailChimp. This way, when they had to get a message out to individual clients, they didn’t have to sort through loads of email contacts to find the groups they wanted. Now, Radcliffe & Associates’ emails are stored in one conveniently located area. Our company’s values are embedded not only in the work we do but with the partners we choose. It is BCom’s goal to seek and foster partnerships with firms who stand for integrity, not for profits. When government affair groups have the proper mediums to connect, they can take action for their clients and push legislation for the betterment of the people.